Everyone is looking for safe avenues to park their money, and to earn returns on that money. Traditionally, we have always invested in residential apartments. However, slowly, a new avenue of investment in real estate has gained ground. If you are looking for a big investment and you have sufficient knowledge about the market, you must explore your options in the commercial sector. 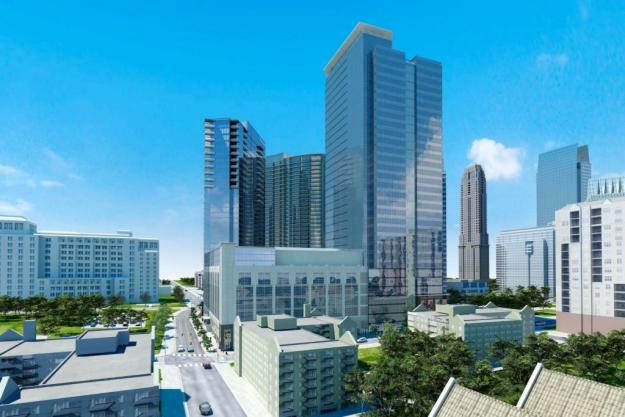 Investing in offices can make you earn high rental income and gain from capital appreciation. With an investment of Rs 10 to 50 crores, you can expect a rental yield of 9_10% per year (the rental income will be higher for investments over Rs 50 crores). However capital appreciation depends upon the timing of the investment and the state of the economy. Land size ranging from 10,000 sq ft. to 30,000 sq ft. is optimal according to the current market situation. If you want to invest in a large office space, you must go for the one that can be divided into smaller units. The Greater Noida Expressway (Sectors 124-144 of Noida) has become the new hub for offices. For instance properties like Lotus Boulevard, Gaur City, Exotica Dream Valie and Urbtech NPX are good options from an investment point of view. If you want to go for Gurgaon you have builders like Vatika, DLF, Unitech, Emaar MGF and many more. Remember, the basic rule of ensuring that you invest with a good and reputed developer. 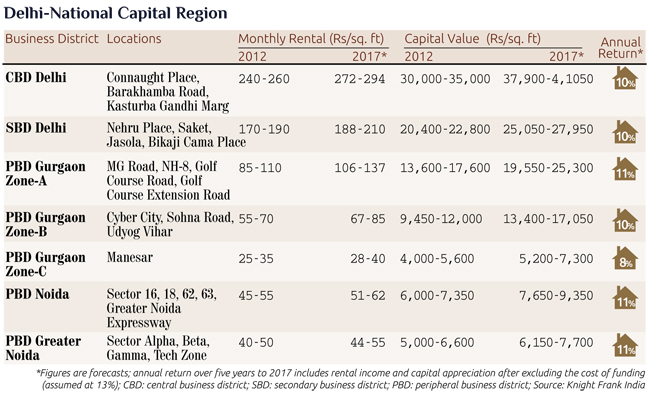 Following are the estimated annual returns over five years from 2012-2017 (including rental income and capital appreciation). Also, look for viable factors before giving away your life long earnings. Avoid remote locations that lack good connectivity to a highway. The roads must be in good shape and should be in close proximity to a hospital and other office spaces. To ensure that your office space is fully utilised, make sure that- the tenant has a business that is profitable and growing. There is always a risk of investing in an office space; that it may remain vacant for lack of tenants, until then you will have to bear the maintenance cost. You may also have to compromise on rent. Sometimes the tenant does not settle for an increase in rent at the time of renewal. You get easy bank loans in case of a residential property. On contrary you will find it difficult to get a bank loan in case of a commercial property. Keeping in mind all the pros and cons, the biggest advantage of investing in office space over residential property is high rental returns. People who are running a full-fledged business or who are looking for a colossal investment can invest in office spaces considering the future returns.